New Disney live-action adaption of favorite animation movie “Beauty and The Beast” is created to take us back to the lovely story and enjoy it in new settings. Though this up-to-date, action packed story does not follow the previous almost twenty five years old film, it brings fresh and modern upgrades influenced by time and the current world events. “Beauty and the Beast” follows the story of Belle, bright young women who lives in a small French village with her father Maurice. She is smart and beautiful, loves reading and helping others but considered a little odd by her neighbors-villagers. Belle does not want to marry everyone's favorite Gaston and ready for something better and bigger in her life. Once her dad disappears in the forest, Belle decides to find him no matter what. Later she finds Maurice in Beast's castle who was taken as a prisoner for stealing a white rose. Belle offers to release her dad in exchange for her stay in the Castle. 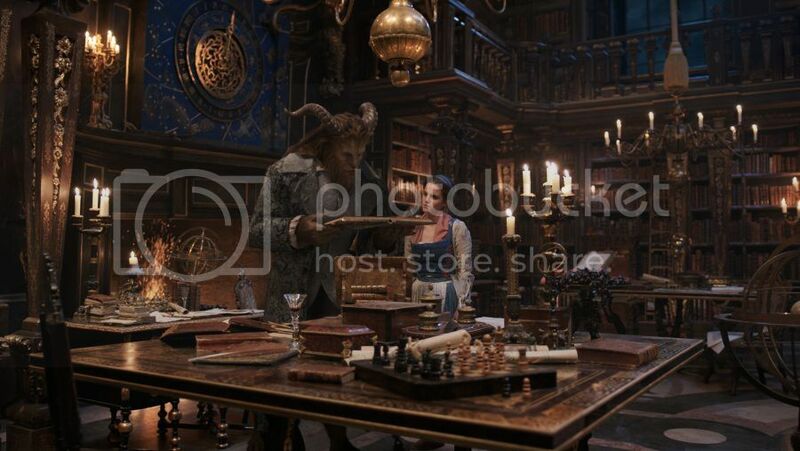 After a while, Belle, becomes friends with the castle’s enchanted staff and learns more about The Beast and his past. The movie is filled with amazing computer effects, it was pleasure to watch. I saw it in IMAX and I think it was incredible. I think 3D version even more exciting. All the scenes in the castle, characters and decoration can blow your mind in a good sense. New “Beauty and the Beast” also has more songs adding few to old favorites. Along with famous and spectacular song and scene "Be Our Guest", The Beast gets his solo song and I think amazing one "Evermore". Most my favorite digital characters like Lumière, Chip and Maestro Cadenza are very successfully transformed from animated movie into live-action and made a great collaboration in new “Beauty and the Beast”. As for main characters I enjoyed amazing work of Dan Stevens as the Beast, Luke Evans as nasty Gaston and Emma Watson as Belle. I like how Emma Watson plays and dances but I'd rather see her moving more like Belle in animated movie, more grace and ballet pas in everyday life. “Beauty and the Beast” is a very successful live-action remake, now playing in theatres across Canada.